What girl doesn't love shopping for new earrings? Why not get a pair that shows off your love for your Greek organization. 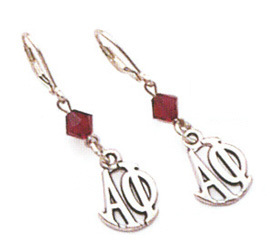 These Sorority Earrings are perfect gifts, whether you're shopping for yourself or for a loved one in a sorority. 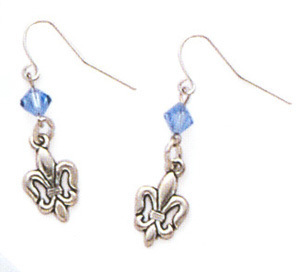 You are going to love the earrings we have for sale here at Greek Gear. They range from elaborate and decorative to small and elegant. For instance, the Sorority Silver Signature Letter Pave Earrings are 8mm studs shaped like your Greek letters with a 1mm white cubic zirconia stud (they also come in Yellow and Rose Gold). Another set you might like are the Enamel Disc Earrings -- petite circular charms with your letters at the center. If you prefer earrings that dangle and jangle, get a pair of Mascot Earrings made specifically for your group. 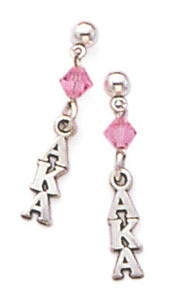 The charm is your sorority symbol with a Swarovksi crystal in your group's official color. You are also going to like the Letter Earrings, which have a similar style except the charm is your two or three Greek letters in a horizontal drop style. When you receive your GreekGear.com box in the mail, open it up and see your beautiful Sorority Earrings, you're probably going to want to try them on immediately. Make sure you have a pair for every important engagement you have planned during the school year! Sorority EarringsThe Greatest Selection. Period.